The iPad CRM Routzy rolls the advanced features of several business utilities into a single, mobile sales center. Traveling sales reps from all over the world use Routzy as a one-stop shop for all their sales needs. With Routzy, there’s no clunky backend, no website to register with, and no online connection required to access your data. Everything you need to go from one end of the sales process to the other is packed inside a single, portable iPad application. Of course, Routzy is more than a prospect and customer management system. With Routzy, you can create quotes and proposals on the fly, in the field. Add line items in seconds and present prospects with completed quotes at the speed of thought. Use Routzy’s powerful drawing and picture tools to bolster your presentation with floorpans, diagrams, and annotated photos. Once it’s time to start work, you can bust out your custom PDF forms and collect customer signatures lickety-split. 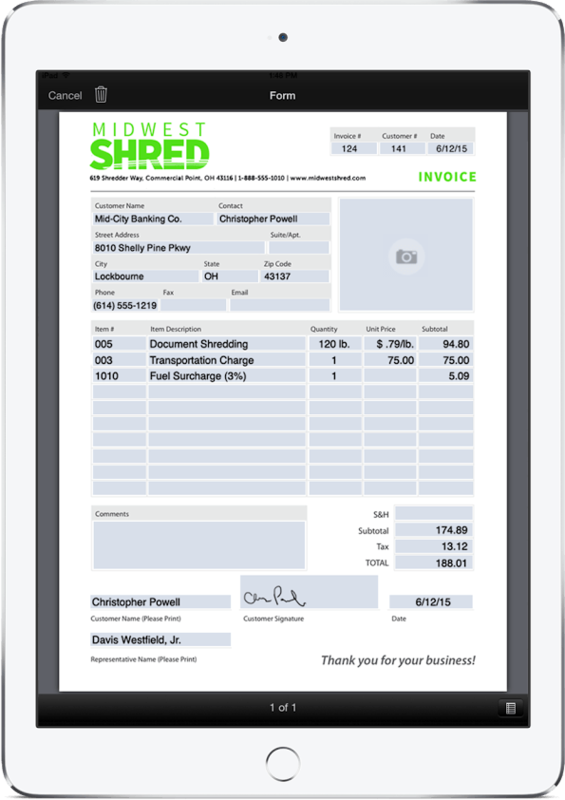 Paperwork can be set up to automatically populate customer information, saving your sales team precious time every day. Best of all, Routzy can be used offline thanks to the software’s seamless, built-in Dropbox integration. No matter where your reps go, they’ll be able to access customer information, make quotes, and deliver killer presentations. Once they reconnect, their work will be available to the office in moments. Powerful analytics and reporting tools allow reps to learn from their mistakes and better organize their sales process. Simply put, Routzy puts the power of a sales desk into the palm of your hand. We recommend Routzy to any-sized business that has a mobile sales or service team and needs to streamline communications between the field and the office. Not sure if Routzy is the right product for you? Call, click, or email to speak with an unbiased Technology Advisor today for a no-cost, no-obligation consultation on your unique needs. Learn everything you need to know about Routzy. Our experts will reach out to you shortly.